There’s yogurt and then there is HOMEMADE yogurt. You’ve got to try this recipe to get a taste of the fragrant and deliciousness of a freshly crafted yogurt. Yogurt, probably super difficult to make, right? They sell so much pre-made in sooo many different flavors, but none stand a chance against the homemade version. This dish has become a little treat we enjoy nearly every day now and we simply eat it plain! The origins of our yogurt making date back to a recent crusade to find digestive health. We had been reading the SCD Diet and along with that, they recommended a homemade yogurt with specific cultures. GI ProStart Yogurt Starter is the brand we have been using with great success. If you just want to get your feet wet and try this without ordering a culture, just grab a container of Fage yogurt for the starter. This is one of the few yogurt brands without lots of thickeners and non-sense added. 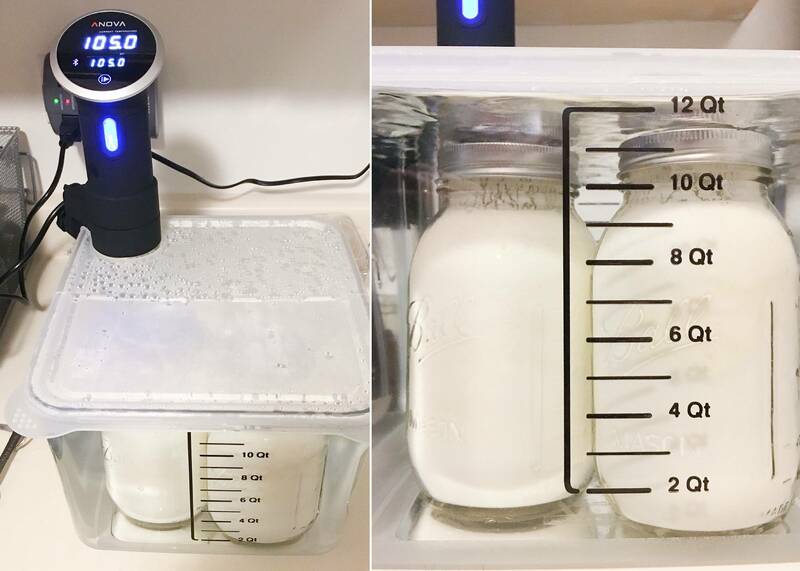 I recently began making our yogurt with the Annova Sous Vide machine. The results have been pretty awesomely creamy and consistently fermented each time. I have also made batches of yogurt the old fashioned way with a cooler and warm water added every few hours. This kinda works, but the Sous Vide is by far an easier way to get great results. For the milk, we have made delicious yogurt with both grass fed whole cow’s milk and whole goat milk. The cow’s milk tends to have a bit of a creamier and more gentle flavor. The goat’s milk goes a little more sour and maintains a bit smoother texture. Try them both and let us know how they turn out for you. Add the entire 1/2 gallon of milk to saucepan and warm over medium heat. Stir regularly and check the temp consistently to keep from over-heating. It is a terrible mess if you forget about it and it boils over… Might want to stay close for this step. Heat milk to a temperature of 180°F and then remove from heat immediately. Let milk cool to 100°F and add the powdered culture or yogurt starter. Transfer to mason jars and secure lids. It’s a good idea to run your jars though the dishwasher prior to use to get them extra clean. A canning funnel can also be helpful for this step. I often spill a little milk getting it from pan to jar. Don’t tell Priscilla! Set up sous vide on 105°F and fill bucket with water. If you have the Rubbermaid 12 qt tub, add about 10qt to get your jars covered. Set it and forget it! Let the sous vide do its magic for 24 hours and then the yogurt will be ready. Add the entire ½ gallon of milk to saucepan and warm over medium heat. Stir regularly and check the temp consistently to keep from over-heating. It is a terrible mess if you forget about it and it boils over... Might want to stay close for this step. Transfer to mason jars and secure lids. It's a good idea to run your jars though the dishwasher prior to use to get them extra clean. A canning funnel can also be helpful for this step. I often spill a little milk getting it from pan to jar. Don't tell Priscilla! Set up sous vide on 105°F and fill bucket with water. If you have the Rubbermaid 18 qt tub, add about 15.5qt to get your jars covered. Set it and forget it! Let the sous vide do its magic for 24 hours and then the yogurt will be ready to eat! Do you immerse your jars in the water or leave the lid of the jars out of the water? I typically use 1/2 gallon of milk, and 2 – 32 oz jars. This fills pretty much to the brim, and then seal with the standard canning lids. They stay sealed through the process and keep any water out just fine. The water level is just enough to cover the jars, but I don’t think it is totally necessary. If I typically leave my yogurt at 115 — 118 degrees, is 105 warm enough? We have had good luck at 105 for about 24 hours. I think it’s pretty forgiving though, as long as it is warm.